Originally published in the May/June 2011 issue of Sustainable Industries magazine. Ken Rhinefrank stands aboard the crane barge Sea Horse and smacks his hand against the six­ton yellow contraption resting on it like a gigantic dumbbell. “Stronger than steel,” he says. It’ll have to be. The dumbbell – the SeaRay developed by Oregon startup Columbia Power Technologies – is about to be lowered into Puget Sound in pursuit of a goal that has eluded engineers for decades: generating reliable energy from the waves. It’s a mother of a technical challenge. A field­-tested, commercial­-ready wave-­energy device – there are only a few in the world – has to withstand the pummeling of wind and surf, the relentless corrosion of saltwater and maybe 300-­pound seals that try to sun themselves on its surface. Rhinefrank’s wind-­reddened face lights up with enthusiasm as he describes the SeaRay – the fiber-­reinforced plastic that gives it strength, the bilge pumps that keep the generator dry (“nothing is guaranteed to be watertight out there”), the swinging floats that catch the heaving motion of the water. He said the test was generating the equivalent of 420 kilowatts of electricity at full scale: “It’s encouraging, though I don’t want to be too enthusiastic until I see all the data,” says Rhinefrank, Columbia’s vice president of research. It has the makings of a classic American tale of discovery and invention. Rhinefrank left a secure job at Hewlett­Packard because, he says, renewable energy excited him more than toner cartridges. Columbia’s breakthrough technology was developed in the wave research tank at Oregon State University and funded by Portland venture capitalists, the United States Department of Energy and the U.S. Navy. When the company greenlights a full­scale device – at 80 feet long, it will be seven times the size of the SeaRay test model – a Bellingham industrial fabricator will do the manufacturing. But here’s the thing: If Columbia reaches commercial­-scale deployment, it will almost certainly happen in Europe – probably the United Kingdom, Portugal or Spain. 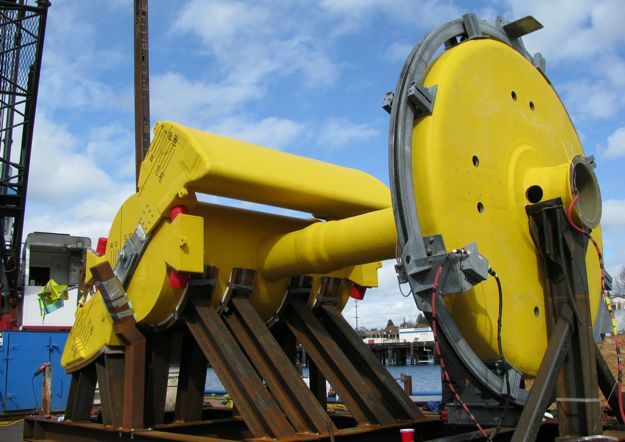 Oregon has emerged as the U.S. leader in wave-­energy R&D, fueled by its fierce coastal waters, OSU’s unique research tank and a lottery-­funded state partnership to promote the fledgling industry. There’s plenty of need for the power, as West Coast utilities have struggled to meet state renewable energy mandates. And the potential wave energy off the California, Oregon and Washington coasts amounts to a staggering 67 gigawatts, according to estimates from the Electric Power Research Institute, a utility-industry-­funded group. Yet industry leaders freely acknowledge the surest markets are elsewhere. In Europe, the first utility-scale wave deployments are already in the water, including the Poseidon project by Floating Power Plant, a Denmark company planning to open an office in Oregon. Two test hubs off the coasts of Cornwall, England, and the Orkney Islands north of Scotland are attracting startups. And governments throughout the European Union are pumping funding into wave energy, hoping to gain the first­-mover advantages that accompany early successes. “They all want to be the Denmark of waves,” says Lesemann. That is, they want to own wave energy the way Denmark dominates offshore wind electricity production. For the U.S. to catch up, companies like Columbia will have to persuade policymakers and investors that wave energy is worth pursuing despite significant technological hurdles and its status as a perpetual “energy of the future” seemingly forever not quite ready for prime time. Duffy offered a million dollars of stock for his Wave­-Power Air­-Compressing Company, one of several businesses around the turn of the last century touting breakthroughs for harnessing the power of Pacific waves. Like the others, his vision came to nothing. In 1909, another venture in Redondo Beach, Calif., raised $100,000 before its pier­-mounted motor sunk “like a lump of sugar when dropped into water,” as the Los Angeles Times put it. A century later, a “land grab” of sorts ensued as companies rushed to stake out the most promising wave-­energy sites off both coasts, driven by state renewable energy mandates and the expectation that a national cap on greenhouse gas emissions was imminent. California utility Pacific Gas & Electric filed applications with the Federal Energy Regulatory Commission for two wave projects off Humboldt and Mendocino counties in Northern California. Chevron and the Canadian company Finavera Wind Energy both jumped in with plans near the PG&E sites. One small Washington state company, Grays Harbor Ocean Energy, sent FERC applications in 2008 for seven sites off six states, each about 100 square miles. Building out that grandiose plan would have required raising $28 billion, Burt Hamner, Grays Harbor’s president, told the Seattle Times. All those ambitious proposals have sunk without a trace. California regulators rejected PG&E’s contract with Finavera, concluding the company’s wave technology was too expensive. The utility then quashed its own Humboldt and Mendocino projects, saying only that permitting and technological costs were higher than they expected. The utility is now considering another site off Santa Barbara County. But FERC filings make clear PG&E was in for a tidal wave of opposition from environmentalists, surfers, fishers and coastal property owners. Federal and state agencies and local municipalities all demanded a say in the process. The issue wasn’t just covering miles of open ocean with wave generators, but also cables and infrastructure to connect them to on­shore grids. Permitting obstacles were a key reason Hamner ditched wave energy to develop turbines for irrigation canals at his new company, Hydrovolts. The annual migration of gray whales up and down the coast was reason enough to worry about the viability off offshore wave power, he says. Shouldn’t project developers have foreseen these hurdles and costs? Hamner says he did, but filing a preliminary application with FERC was so easy that he didn’t see much of a downside. That rush prompted FERC to clamp down and scrutinize companies’ proposals more closely, which slowed the flow of applications. Then one of the few West Coast projects to get in the water, a Finavera test buoy off the Oregon coast, sank just a day before researchers were set to remove it in 2008. “That’s like saying, ‘We’ll never fly,’ ” after the first Wright brothers’ failure, he says. Still, in Australia last year, the country’s first grid-­connected wave device broke its moorings, crashed into a breakwater and sank just two months after deployment. Pelamis’ wave generators at the world’s first commercial­-scale wave farm, Agucadoura in Portugal, had to be removed two months after launch in the fall 2008 to repair leaks in the buoyancy tanks. The subsequent financial collapse of the project’s backers put a re­launch on indefinite hold. Such setbacks have made investors and energy­-industry watchers understandably wary. Mark Bünger, research director at the market analysis firm Lux Research, says his company considered devoting more resources to tracking the industry but decided against it. The sheer size and cost of prototypes presents a major challenge, he says. (Columbia’s full­size Manta Ray will weigh at least 500 tons; each of the Pelamis “sea snakes” used at Agucadoura is 460 feet long.) Just as elephants live longer and evolve more slowly than fruit flies, technology evolves more slowly at larger physical sizes, says Bünger. The animal metaphors, by the way, are a favorite of wave engineers. No single design has become dominant, leaving room for a diversity of creations that would have made Darwin giddy. The Pelamis sea snakes float semi­-submerged, channeling waves into long cylinders to pump oil through motors to drive generators. The Scottish company Aquamarine, which opened an office in Newport, Ore., last year, builds a device called the Oyster that has one arm resting on the sea floor and another that swings back and forth on a hinge, like an oyster shell. Principle Power of Seattle is working in Tillamook, Ore., to see if it’s feasible to add column­-like wave devices to its floating wind­ turbine platforms. And Texas-­based Neptune Wave Power is using OSU’s wave tank to test a prototype that uses a horizontally swinging pendulum, essentially the same technology used in self­winding watches. Bünger compares this stage to the early days of aviation, when would-­be pilots launched biplanes, triplanes and other variations before settling on a favored model. Back aboard the crane barge, Rhinefrank shows me what Columbia believes is its breakthrough discovery. We’re moored at the Lake Union Dry Dock, one of the vestiges of maritime Seattle tucked along a shoreline of yacht clubs and $800,000 houseboats. The ripples here hold nothing like the churn off the Oregon coast, some of the roughest waters in the nation. Each wave includes two essential movements, a vertical heave and a horizontal surge. Other wave devices, Rhinefrank says, capture only one of those sources, missing approximately half the potential energy. The “aha moment” for Columbia’s researchers at OSU came on their third­generation design, when they figured out how to design a float that would translate both kinds of movement into a rotary motion to drive a generator, mimicking the undulation of a manta ray. Lots of early-­stage companies have similar stories about their “game changing” innovations. Without testing, they’re just claims – that’s why Columbia is keen to keep putting models in the water. Hundreds of sensors on the SeaRay measure the wave direction, wind speed, power generation and dozens of other inputs, then transmit them to the company headquarters in Corvallis. If the U.S. is serious about promoting wave energy, according to Lesemann and nearly everyone else I spoke to in the industry, it needs a testing hub like the ones off Cornwall and the Orkney Islands. That would allow engineers to plug in a variety of devices, drop them in the water, and measure how they perform, bypassing the permitting delays that can eat up years for isolated projects. It took Columbia a year to get permits for its Puget Sound test, which didn’t include the complications of connecting the device to an onshore grid. Andrea Gill, a renewable energy specialist for Hawaii’s economic development department, says she talked with the Department of Energy about such a hub last year but couldn’t secure funding. “Being able to test multiple devices at sea, in real­-time conditions, while grid connected, and still being able to do R&D on them – that’s definitely a gap in the U.S.’ capabilities,” she says. OSU has considered a mobile testing center based on a boat, or a site with an underground cable running to shore, says Jason Busch of the Oregon Wave Energy Trust. The surge of interest around the Cornwall hub shows it would pay off economically, he says. “If we had a national test center, wow,” he says. “It would just be a fact that companies would move here. But it needs to happen now.” Busch, the state’s point man for promoting the wave industry, has gotten a close look at how difficult permitting can be as he’s watched the trials and tribulations of Ocean Power Technologies, the Nasdaq-­listed New Jersey company that plans to deploy a 150-­kilowatt PowerBuoy off the coast of Reedsport this summer. The company, whose project is the most advanced of all the Oregon ventures, has been planning and seeking FERC approval since 2007, and it’s still awaiting the go­ahead for the 10­buoy second phase. More importantly, Ocean Power’s journey has taught everyone involved – federal and state regulators, businesses, investors, fishers and crabbers – what to expect and how to negotiate the next project. That kind of excitement from engineers and investors makes Busch hopeful, even if federal support lags for the time being.